Many of Ireland’s almost 10,000 charities are funded by the state to provide health, social and community services, and they form a critical part of Ireland’s social infrastructure, supporting people and communities the length and breadth of the country. the effects of these externally-set compliance requirements on the boards of organisations in terms of reducing their autonomy and independence. Many of these issues are now under consideration in the context of the commissioning approaches that are increasingly being adopted by the statutory authorities who fund the work of community, voluntary and charitable organisations. 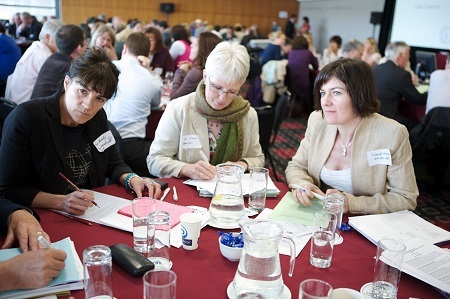 The HSE and Tusla are currently developing and implementing commissioning approaches to funding services provided by community and voluntary organisations. We are working closely with our agency-funded members to identify and communicate the issues that need to be addressed if we are to benefit to the full from the role played by community and voluntary organisations in delivering public services and involving the people, and the communities they support, in the shaping of those services. We published our Let’s Commission for Communities Report in 2016, and have established networks of Tusla-funded and HSE funded organisations within The Wheel’s membership. We also sit on Tusla’s Commissioning Advisory Group. Members of The Wheel that are funded by the HSE or TUSLA are invited to join our HSE and Tusla Networks. make recommendations on how the relationship between the state and voluntary organizations should evolve in the future. This review is clearly very significant in relation to the nature of the future relationship between the community, voluntary and charity sector and the state – and it will undoubtedly play an important part in shaping future policy towards the sector. The Wheel is working to ensure that the many complex issues identified by our members that relate to their publicly funded service-provision role are brought to the attention of the review group. We made a formal submission to the Review Group. The Wheel maintains close contact with the Department of Public Expenditure and Reform (DPER), Government funding departments such as the Department of Health and the Department of Children, over the impact of important statutory policies (such as DPER 2013) on service-providing organisations. We have also been engaging closely with the Office for Government Procurement and with DPER in relation to development of the current Statutory Public Procurement Guidelines, to ensure their incorporation of the full range of flexibilities afforded by the EU Public Procurement directives on which they are based. The Wheel is pleased to see that the published procurement guidelines permit a high degree of flexibility by public service commissioners in how they choose to fund human, social and community services – and we are working hard to ensure that the approach taken by service-commissioners is not unnecessarily prescriptive.